1. Before I do any sketching at all, I will read a manuscript over and over many times. Sometimes I even close my eyes and just brainstorm ideas. This step is important to me because this is when all the initial images and emotions I get from a story start forming in my head. 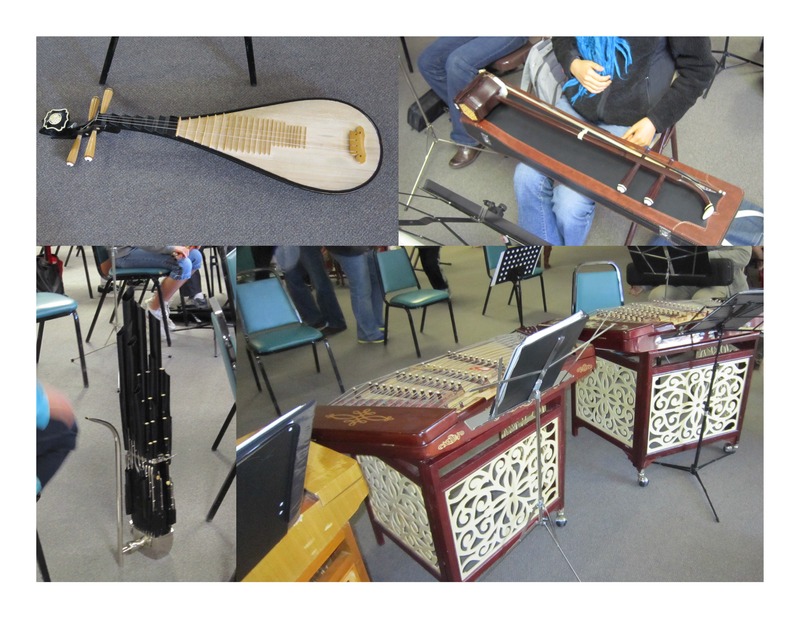 I also start doing research and compiling photos at this point as I did for Summoning the Phoenix: Poems and Prose about Chinese Musical Instruments. Researching is very important to me before I begin a project especially for a nonfictional picture book. In this case, researching on the Internet was not adequate since I needed to have a good detailed look at each instrument. Fortunately, the California Youth Chinese Symphony was kind enough to allow me to take photos during one of their practice sessions. I was able to get a firsthand look at how the musical instruments were played, what they sounded like, and what they looked like in real life. All those elements eventually shaped the final artwork. 2. After researching, I then start on rough thumbnail sketches. Since I have a hard time drawing at a very small scale, my thumbnails are usually at half size. 3. Next I refine my thumbnail sketches. I know that for this particular spread, I wanted the background to have a grandiose feeling of wind, waterfalls, and mountains that was reminiscent of a traditional Chinese painting. This was the imagery that popped into my head when I did my initial brainstorming. 4. Sometimes I have a couple of options with different compositions. 5. Once the final thumbnail sketch is chosen, I will work on the final, full size sketch. 6. I scan the image into my computer and color in Photoshop. Here is a final illustration of a girl playing the guzheng from Summoning the Phoenix: Poems and Prose about Chinese Musical Instruments.